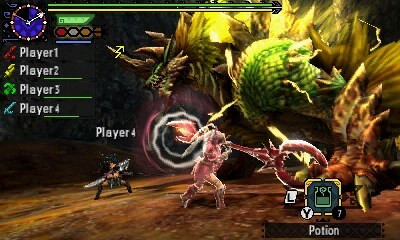 Full disclosure: I’ve never completely understood the mechanics or appeal of Monster Hunter. I’ve sampled a few of the games before — my brother’s fanatical devotion to Tri encouraged me to give that title, Freedom Unite and the two Ultimate games on 3DS a shot — but none of them have quite clicked with me. That pattern unfortunately continues with Monster Hunter Generations, but don’t fret; after spending so much time with it, I can’t possibly say my personal lack of interest has anything to do with the clear amount of polish and love put into this series. At the very least, I’ve now got a good idea why so many people line up around the block every time a new one comes out — and while those diehards will probably love a lot of the new stuff that Capcom’s cooked up this time around, I’m also equally impressed with their efforts to make the series more accessible to newcomers. Monster Hunter Generations has already had a pretty solid foundation on which to build its hunting gameplay: here in the West, we’ve already seen Monster Hunter 3 and 4 Ultimate use the same engine on 3DS before. Naturally, that means Generations feels like the most polished entry to date — and it gives hunters a couple of cool new options in the form of Hunting Arts and Hunting Styles. The former are fairly standard “ultimate” moves that involve charging up a gauge and unleashing powerful maneuvers, such as dealing huge damage or healing all your allies at once. You’ll unlock more and more of these specials as you put quests under your belt, giving you increased options for when you need an eleventh-hour gambit. The latter consist of four different “control modes,” if you will, which aim to change up the way players traverse and fight. 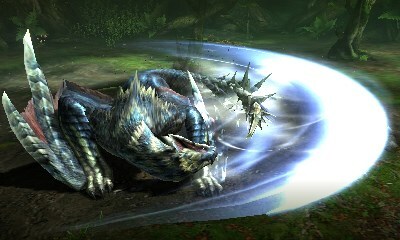 The first, Guild Style, is the regular one that players know and love; Aerial Style allows players to leap into the air any time they evade into a monster or fellow hunter; Adept Style heavily rewards skilled evasion and blocking; and Striker Style changes up the combos and gives hunters three Art slots to play around with. These new Styles, in particular, should make the game feel quite a bit different for veteran hunters and give them some new ways to benefit from high-level play. They’re not reinventing the wheel by any stretch of the imagination, but that’s not really expected at this stage anyway — what Monster Hunter Generations offers, from these new styles of control to an all-star lineup of beloved monsters, is a definitive version of the game on 3DS. Franchise fanatics will no doubt eat this little love letter up. As I said, though, this might just be the most accessible entry yet for people (like me!) who feel left out as each new version takes the gaming world by storm. There are a set of awesome tutorial quests here that can be completed in just a couple of hours, and they really do a great job of giving you a primer on the series’ most important systems. From bug catching to mining to slaying and capturing monsters, it’s all here and explained in super-clear detail. Plus, the character that delivers the tutorials is written in a pretty hilarious way. I’m sure more cynical players will roll their eyes at him, but for a baffled guy like me, his jokes were just the lighthearted thing I needed to make me feel better about sucking so much. As far as graphics go, Monster Hunter Generations continues to absolutely push the 3DS hardware to its limits. The environments, creatures and effects are more spectacular than ever before here, especially in 3D — although this comes at the cost of the buttery-smooth 60 FPS found in Monster Hunter 4 Ultimate. In fact, sometimes the system just can’t keep up with the spectacle this time around, and it’s not out of the question to see the framerate drop quite a bit during the most chaotic battles. I’ve heard this problem is a bit more significant on the original 3DS models, so New 3DS seems to be your best bet if you want the smoothest experience possible. Even with things locked at 30 FPS, though, I couldn’t take my eyes off this game for a second. Pop your headphones in, too: even though I’m not a huge fan of the franchise, I have to admit there’s nothing quite like getting fully immersed the joy of the hunt this way. The sound design is just that good. Monster Hunter Generations is a solid upgrade that franchise fanatics will absolutely love. The Hunting Arts and Hunting Styles provide a really neat way to switch up the normal mechanics, and the collection of monsters and quests serve as a sort of “best of” collection before the inevitable fifth main entry in the storied series. 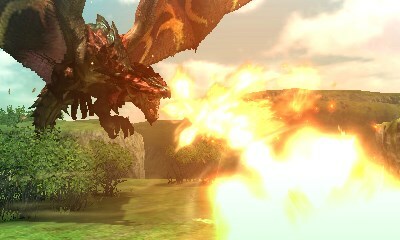 If you don’t yet live and breathe everything Monster Hunter, though, this game’s got you covered as well. A superb set of tutorials can help you learn everything there is to know about the ludicrously deep systems, from cooking to crafting to taking down the biggest and baddest creatures out there. Whether you’re the sort to line up around the block for the next entry or haven’t set foot into the uncharted territory of MonHun’s maps, Generations is the definitive version for you to play on 3DS.